As per estimates of a report by Transparency Market Research, the global narrowband IoT market will be valued at US$1052.69 mn by the end of 2025, expanding at a CAGR of 33.12% between 2017 and 2025. The segments of the narrowband IoT market based on end-use industry are healthcare, energy and utility, agriculture, retail, transportation and logistics, smart cities, and others. The report divides the global narrowband IoT market into the geographic regions of North America, Europe, Asia Pacific, the Middle East and Africa, and South America. Europe is one of the key contributor to the overall market as the region is home to some of the key industry players and early adoption of narrowband IoT technology in the region. Asia Pacific accounts for the second-leading market share in the global market for narrowband IoT. The regional market is expected to expand at a phenomenal 34.28% CAGR between 2017 and 2025. The growth of Asia Pacific market is mainly because of significant investments for development of smart cities. Key players operating in the global narrowband IoT market profiled in this report are Huawei Technologies Co. Ltd., Ericsson Corporation, Nokia Corporation, Quectel Wireless Solutions Co. Ltd., Sierra Wireless, Deutsche Telekom, China Unicom, Qualcomm Technologies Inc., Vodafone Group plc, u-blox, ZTWE Corporation, SEQUANS Communications SA, Intel Corporation, China Telecom, and Etisalat Corporation. This report on the global narrowband IoT (NB-IoT) market provides analysis for the period 2016 – 2025, wherein 2016 is the base year and the period from 2017 to 2025 is the forecast period. The report covers factors which are ought to affect the narrowband IoT (NB-IoT) market. It also covers drivers, restraints and opportunities which support for the growth of narrowband IoT (NB-IoT) market. The regional trends covered in the scope of the study is expected to influence the market growth during the said period. The study provides a comprehensive analysis on market growth throughout the above forecast period in terms of revenue estimates (in US$ Mn) across geographies. The report also includes key industry developments, Porter’s five forces analysis and ecosystem analysis. Furthermore, the study also covers key market indicator which provide supporting factor for the growth of the narrowband IoT (NB-IoT) market. The narrowband IoT (NB-IoT) market study covers market attractiveness analysis for all the segments and regions which identifies and compares segments market on the basis of CAGR and market share index. The global narrowband IoT (NB-IoT) market is segmented on the basis of component, application, end-use industry and geography. The component is segmented into hardware, software and services. The hardware segment is further sub segmented into module and others for better understanding of the sub segments, which are playing key role in narrowband IoT (NB-IoT) market. On the basis of Application, it can be further bifurcated smart metering, asset tracking, alarms & event detectors, smart bins and others. Furthermore, the end–use industry is further segmented as healthcare, retail, energy & utilities, transportation & logistics, agriculture, smart cities and others. 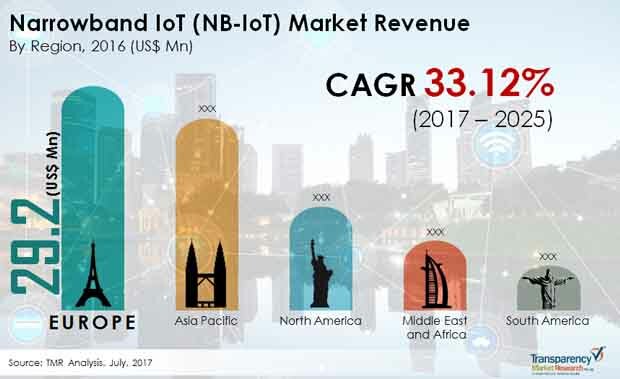 Geographically, the report classifies the global narrowband IoT (NB-IoT) market into North America, Europe, Asia Pacific, Middle East & Africa (MEA), and South America; the regions are analyzed in terms of revenue and also included analysis of countries such as the U.S., Canada, U.K, France, Germany, China, India, Japan, Australia, GCC Countries, South Africa, and Brazil. The market size and forecast for each region and country has been provided for the period from 2016 to 2025 along with the CAGR (%) for the forecast period from 2017 to 2025. The report also includes competition landscape which include competition matrix, market share analysis of major players based on their 2016 revenues. Of these, major players are profiled in these market which plays the prominent role in the entire ecosystem. Competition matrix benchmarks leading players on the basis of their capabilities and potential to grow. Factors responsible for benchmarking the players are market position, offerings, Research & Development and others factors includes top line growth, market share, segment growth, infrastructure facilities and future outlook that are attributed to company’s potential to grow. This section also identifies various recent developments carried out by the leading players. Key Players profiled under narrowband IoT (NB-IoT) market are Key Players profiled under Narrowband IoT (NB-IoT) market are Huawei Technologies co. ltd., Qualcomm Technologies, Inc, Ericsson Corporation, Vodafone Group Plc, Nokia Corporation, u – blox, SEQUANS Communications SA, Quectel Wireless Solutions Co., Ltd, ZTE Corporation, Sierra Wireless, Intel Corporation, Deutsche Telekom, China Telecom, China Unicom, and Etisalat Corporation, etc.